Writing a blog is often akin to the modern diary. One is able to look back and see how things changed. 2011 was quite an interesting year in food, both in travel and domestically. Even late in the year, I continued to experience some notable culinary items. I share my remembrances of the most notable restaurant experiences I had, as we all look forward to what 2012 offers. These are the dishes that I would be happy to return to, and have again. I hope you'll get a chance to try them, too. Miso Butter Ramen, Cafe Kubo, Houston. Rich, flavorful, and not what most stereotypically think of Japanese food in Texas. The pat of cold butter that melts as you mix the hot broth up is key. It is comfort food, with just a touch of the exotic. Taiwanese Lucky Cake, Six Ping Bakery, Houston, TX. Salted duck egg yolks, raisins, and pork fat combine in a riotous combination of flavors and textures. This is one of the pricier options in this otherwise inexpensive bakery, but well worth getting. Also, it's seldom labelled in English. Don't miss out on the quail egg bao, though. Fish Tamales, Hugo's, Houston, TX. Takes guts to put something as delicate as fish into the robust masa package of a Mexican tamale, but Hugo dares. Crispy fried intestines, Mala Sichuan Bistro, Houston, TX. At the moment, Mala is the focus of quite a bit of foodie buzz, and well deserved. The young restaurant has already tweaked its menu with some unique offerings, and is quickly introducing the Houston public to the maddening pleasures of the Sichuan peppercorn. Though I've tasted some amazingly well seasoned dishes here, from duck to konjac, the intestines surprised me with its delicacy and texture. Mangalitsa pork chop, braised fennel, blue cheese mash, Max's Wine Dive, Houston, TX. A special creation by Steve Marques, then sous chef at Max's, he has since moved on to Tasting Room Uptown. By combining all the components in a bite, the melange elevates beyond the sum of its parts. Spicy Spinach, Peppersoup Cafe, Houston, TX. We may be encountering a growth of African cooking in Houston, spearheaded by idealistic entrepreneurs wanting to evangelize the cuisine. While I enjoyed the fritters and signature pepper soups here, my mind remains on the spinach. Humble in appearance, it packed a flavor punch the stands up to the heat of the feast. Crispy beef cake, Yummy Kitchen, Houston, TX. Fetishists of Taiwanese cooking tend to focus on stinky tofu (chou doufu), and Yummy can deliver on that front. In fact, newcomers are often alarmed by the acrid aroma usually not associated with freshly cooked food. Those that persevere, however, are awarded with some delicious creations. Don't overlook the funnily named crispy beef cake, which layers braised seasoned beef and scallions in crispy fried thin pastry. A savory creation, it affords the textural and flavor diversity that is addictive and substantial. Sadly, I don't have much in the way of desserts to report in the Houston area. It's a plight that I am not alone in bemoaning. But did have a couple of notable sweet items this year outside of the city. Burnt marshmallow and nutella liquid nitrogen milkshake, Flipburger, Atlanta, GA. The use of liquid nitrogen was pretty much just eye candy (and this photograph has superior eye candy already), but the flavor combination of nutella and burnt marshmallows is enlightening. Pinoy flavor macarons, Bagoong Club, Manila, Philippines. The restaurant scene in Manila has ballooned, and truly great fusion concepts converging in the megalopolis. Flavors here included ube (purple yam), tablea (raw chocolate), calamansi, and toasted coconut. The texture was spot on, and the flavors bright and sparkly. I do have a couple of beverages to share with you. I think these are under appreciated gems. Move aside, champagne. Mint tea service, Casbah Couscous Grill, Houston, TX. Perhaps the last remaining Moroccan restaurant in Houston, Casbah serves up a traditional mint tea, poured with a flourish from tea pots. One finds oneself unable to stop drinking this stuff, shared among friends, wiling away the time over tagine and couscous. It's hospitality captured in a cup, refilled over and over again. 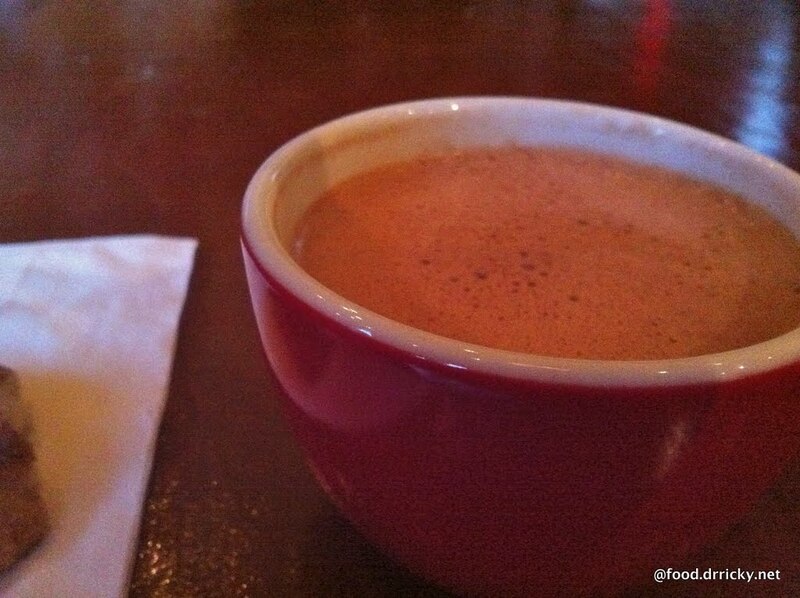 Drinking Chocolate, Cafe Luz Houston. The scientific genus of the cacao plant is Theobroma, which is Latin for "food of the gods" - and the smooth, subtly sweet concoction holds true to that appellation. Using single source chocolate that is locally roasted and ground (very local - in nearby Spring), the different batches reflect the complex personalities of the beans and methods chosen. Chocolate with character and depth - what better way to welcome hope for the year to come.